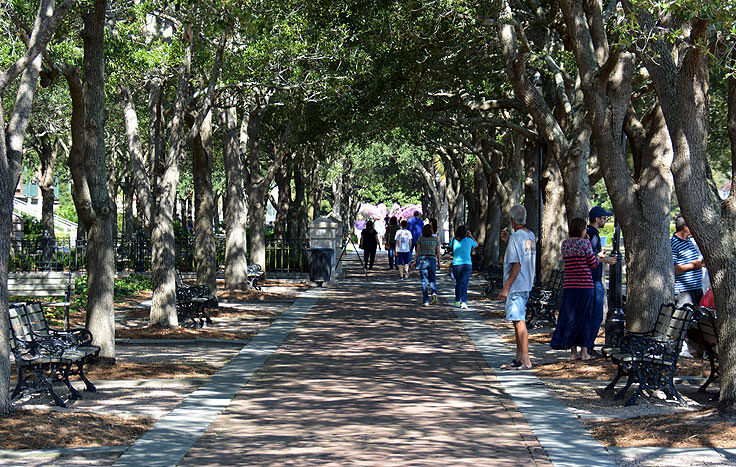 Life in the Lowcountry is all about slowing down and taking a moment or two to relax, and locals and visitors both agree that Charleston's Waterfront Park is the perfect venue to stretch out and soak up the scene. 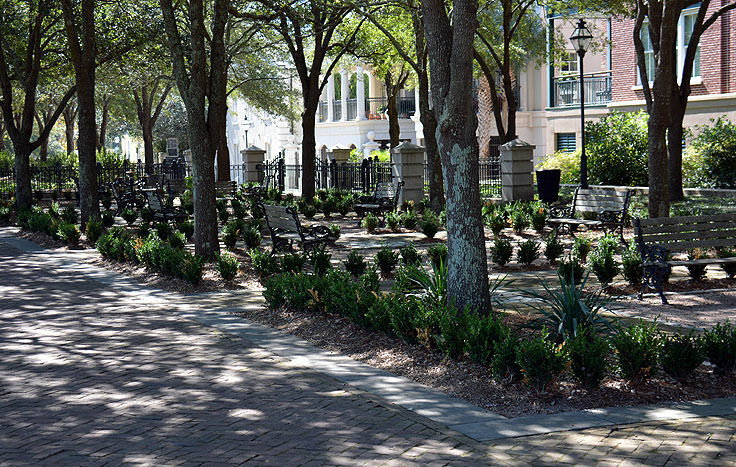 With a prime location overlooking Charleston Harbor and the Cooper River, and more than 10 acres of room to roam, (most of which is waterfront), Waterfront Pak is essentially a romantic, engaging, serene, and perfectly picturesque destination that will make any newcomer fall in love with this unique southern city. 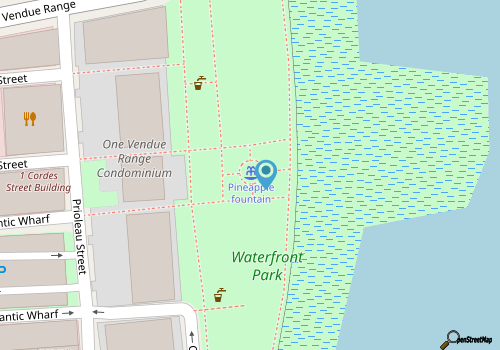 Waterfront Park, located along Concord Street, was historically a long parcel of land that was the center of local maritime traffic travelling in and out of Charleston Harbor. Several wharfs and shipping terminals could be found along the water's edge, and were a seemingly permanent fixture in the city. After the Civil War, however, and a subsequent long period of a declining shipping industry as new port hubs opened up along the East Coast, the area's activity dwindled until the small region was all but obsolete. This period of decline was cumulated in the summer of 1955 with a great fire at an on-site steamship terminal. By the 1980s, the area was an overgrown and weed-ridden patch of downtown land that was marred with gravel parking lots and charred pilings of the buildings that once stood long ago. Despite the obvious deterioration and apparent abandonment, plans to rejuvenate the site began as early as 1975 under the direction of mayor Joseph P. Riley, Jr. Acquisition of the land began in the late 1970s, and after a full decade of raising funds, planning, and getting the proper environmental go-aheads, construction began on the new "Waterfront Park" in the late 1980s. In 1989, Hurricane Hugo would put the construction crew on a long hiatus, but nevertheless, the park opened relatively on schedule in May 1990, to great local anticipation. 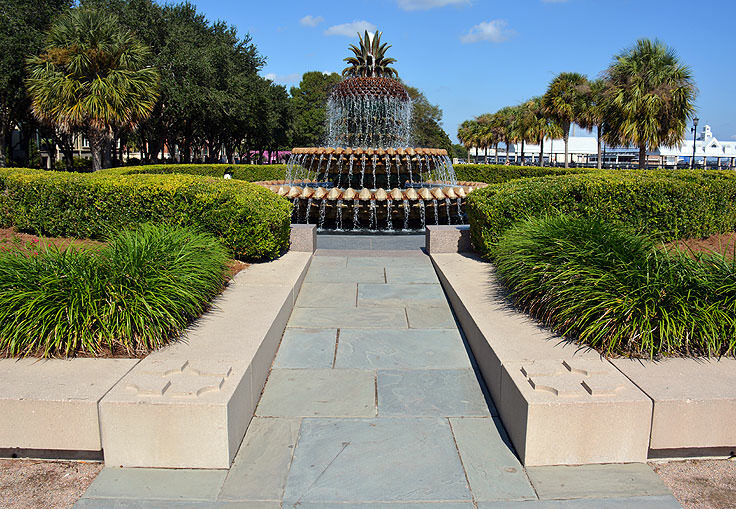 The park itself was designed by Stuart O. Dawson of Sasaki Associates, and was divided into distinct sections which were intertwined with both riverfront and off-the-water walking paths, and were tied together by a noteworthy fountain which is topped off with a statue of a Palmetto tree. A success from the start, the park was awarded the 2007 Landmark Award from the American Society of Landscape Architects and the National Trust for Historic Preservation, which rewards newer landmarks that have an inherent and distinguished landscape architecture at their core. Today, visitors will easily see why this park gained national acclaim, as the long stretches of wide riverfront walking paths are perfectly picturesque, and capable of allowing a crowd of park visitors to relax and enjoy the activity along the harbor front. 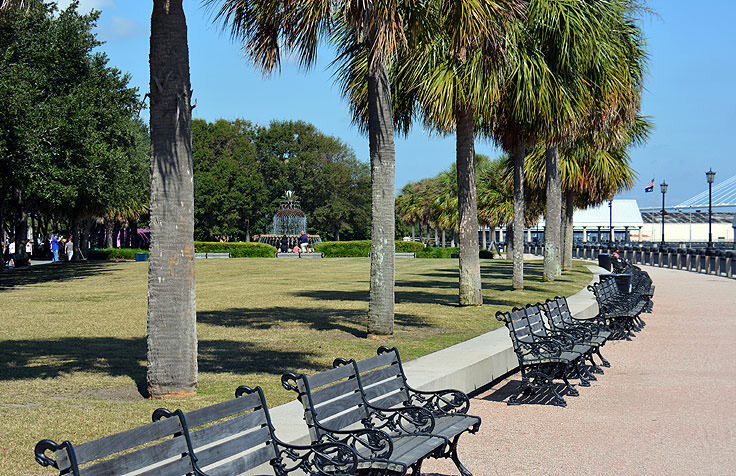 Dozens if not hundreds of benches are stationed within the park, both along the river and in the well-tended green spaces just offshore, and tall palmetto trees create a slightly shaded barrier just yards away from the water's edge. Family-sized swings invite park patrons to relax and take advantage of the cool breezes, and a large rectangular shaped central lawn is a popular spot for picnics and sunbathing. The park essentially covers over 1,000' feet of coastline, an as a result, is one of the best places for sightseeing, nature watching, and outdoor interests of all genres. Pelicans and egrets make frequent appearances along the riverbanks, and visitors can often spot fast-moving sailboats and giant cruise ships lurking just offshore. 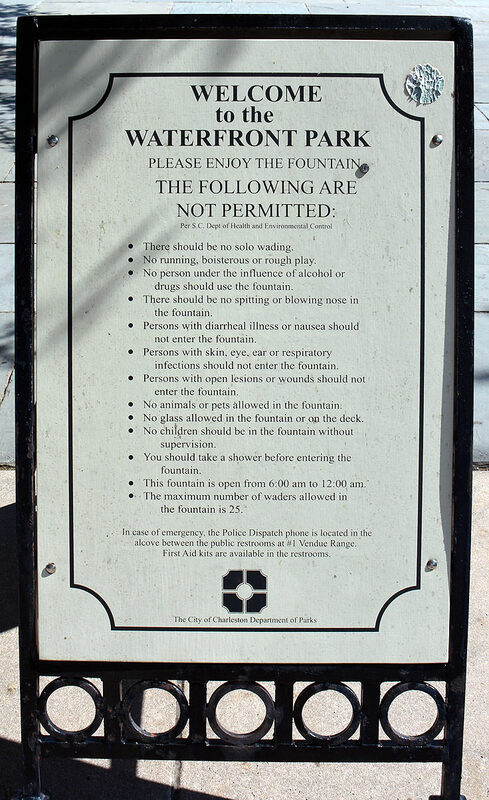 Trash bins and drinking fountains are strategically placed around the park, as are floral garden displays and, naturally, the park's famed palmetto tree fountain. Lit up at night, the fountain is a favorite photo-op for visitors of all seasons, and is arguably one of the most photographed landmarks along the waterfront. 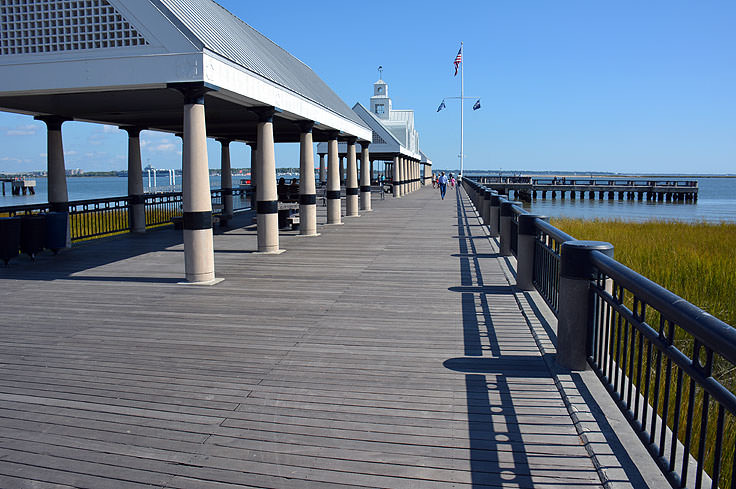 At the northern edge of the park, visitors can stroll down a wide pier that juts out into the harbor, and is shaded by a long and ornate gazebo. Picnic tables, benches, and porch swings are located all along the structure, inviting patrons to get off their feet and relax with miles of water views in every direction. The end of the pier expands into a wide T-shaped platform, (with even more benches), ensuring that plenty of passer-bys can stretch out, take in the view, and enjoy a little peace and quiet. The park is popular with runners, bikers, birdwatchers, and anyone who enjoys a cool waterfront rest stop, and is open daily to the public. Evening patrons are encouraged to swing by the distinctive central fountain, which provides a unique and romantic glowing backdrop to any evening stroll. Springtime visitors will also want to be on the lookout for the bright fuschia blooms which seasonally circle the fountain in the hundreds, and are impossible to miss. 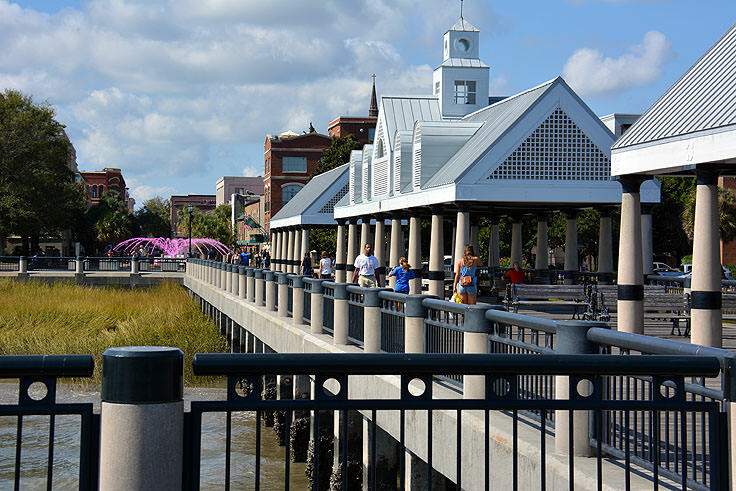 Like many of Charleston's best loved locales, Waterfront Park has thrived thanks to a dedicated preservation effort that transformed this former fishing and shipping industry hub into something uniquely, and unmistakably beautiful. 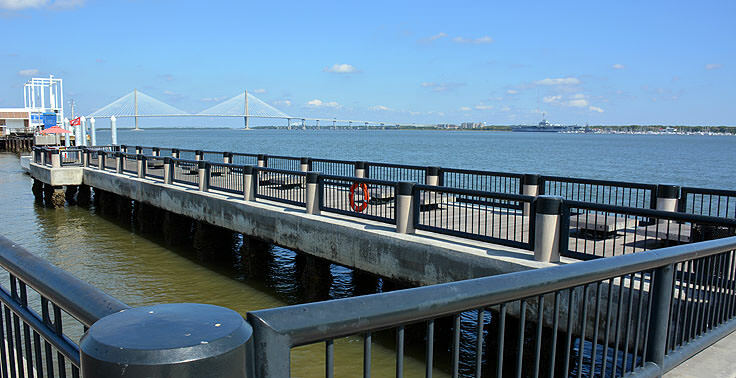 A favorite destination for romantic strolls and on-the-water photos, Waterfront Park is a grand respite for any visitor who wants to take a break from the downtown touring, and simply enjoy a little slice of Lowcountry life by the water. It's almost ironic that The Charleston Museum, which paints a complete portrait of Charleston's centuries of history, has a unique history all its own. Well known as "America's First Museum" and recently named one of the top five museums in Charleston by The Travel Channel, the museum is certainly worthy of exploration for patrons of all ages, tastes and interests.